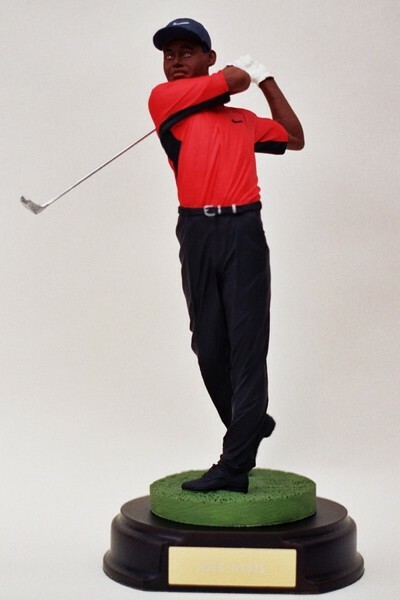 A superb figurine of Tiger Woods, arguably the most well-known modern golfer of all time, as well as the most controversial. Eldrick Tont "Tiger" Woods has many achievements including, being World Number One for the most consecutive weeks and for the greatest total number of weeks of any golfer; he has been awarded PGA Player of the Year a record eleven times; the Byron Nelson Award for lowest adjusted scoring average a record eight times, and has the record of leading the money list in ten different seasons. He has won 14 professional major golf championships, and 80 PGA Tour events. Woods leads all active golfers in career major wins and career PGA Tour wins. He is the youngest player to achieve the career Grand Slam, and the youngest and fastest to win 50 tournaments on tour.